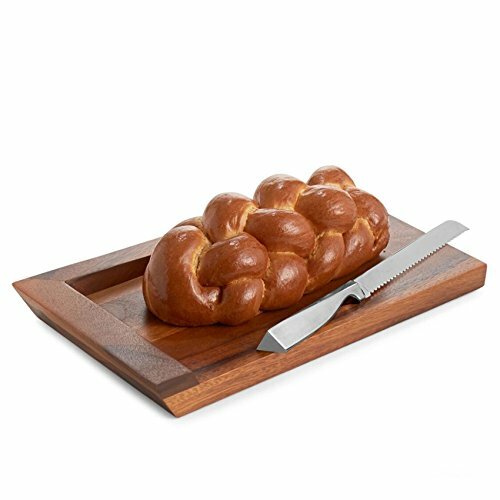 Celebrate the Sabbath with this challah bread board and knife from the Geo line by Nambe. Crafted from rich, dark acacia wood this bread board is certain to make an elegant addition to both your home and your Sabbath day table. A bread knife is included, made from quality Nambe alloy that guarantees an effortless, seamless slicing experience. Designed in a pleasing, geometrically inspired fashion this challah bread board is the most unique on the market. If you have any questions about this product by Nambè, contact us by completing and submitting the form below. If you are looking for a specif part number, please include it with your message.